Before we share our official NAME REVEAL of #BabyYniguez4 we thought it would be fun for you guys to guess our baby’s name! 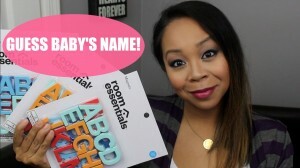 In the video I gave 2 clues on how you can guess the baby’s name. 1. There is both the letters “L” & “Y” in her name…just as our other kids have EMELYN, MALIYA & DYLAN. 2. The rest of the letters in her name are taken from both me and hubby’s names… BRYAN & NICOLE. We will announce the name within the next week and choose 1 winner that guesses the correct name to win a special prize pack from me to you! I have yet to gather some fun items together but I’ll customize it for the winner! Comments will be set private, so that only I can see them and other peoples answers won’t give it away.